Have a Holly Jolly Christmas this year. 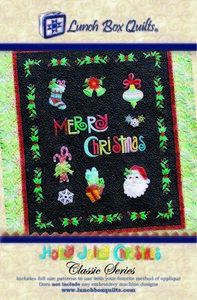 Contains thirteen appliqué design templates that feature images from your favorite Christmas as a child. Use the designs to make a full sized quilt or decorate for the holidays with a wall hanging. Two quilt patterns are included to make a 54" x 62" large quilt, or an 18" x 44" wall hanging. Package does not come with embroidery designs in electronic format. This pattern is for those who wish to make the quilt using traditional appliqué methods.